Wal-Mart’s social media policy could be easily searched via Google; however they seem to call it their guidelines, and provide many different category of guidelines underneath. 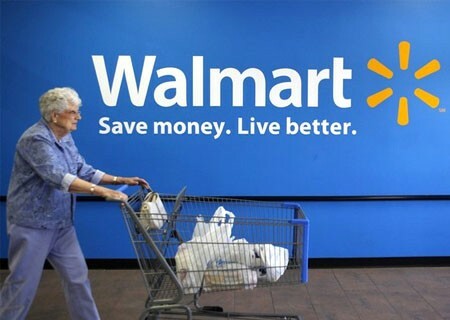 They first are telling their customers about their Twitter and Facebook engagement and what they should expect out of them online and what Wal-Mart expects from their followers. It then follows with what guidelines are expected from the Wal-Mart associates and what they need to follow. Finally it concludes with a few guidelines for participants of some of their promotional sponsored associates and a Mom Program. The guidelines are under their homepage and also give viewers the option to share and tweet it out, so it shows how open they are about their guidelines and want their employees and the followers to know exactly what is expected. And consider using company established channels for job-specific issues. And for managers: be familiar with the Social Media Management Guidelines (which can only be accessed via login/password). But Wal-Mart also tells their customers what it is they should expect to see on Twitter and what to expect on and what they expect of their customers on Facebook! On Twitter they give a list of all official Wal-Mart Twitters, so people are not asking questions to faux accounts. They also tell the customers on Twitter that they will try and respond to as many relevant questions as possible. On Facebook their guidelines seem a little bolder, (they are literally bolded). They ask that their followers to be polite, don’t break the law, stay relevant and “keep it real.” I find these Facebook guidelines to be a little strange to put in an official document, and that they are telling their what is expected from them. If I was Wal-Mart I would make less of an emphasis of these Facebook guidelines by first un-bolding them. I do not see why those ones are much more important than the guidelines for the employees of Wal-Mart. I think it is too much for a large corporation like Wal-Mart to make rules for their followers. They should make more of an emphasis on what is expected of their employees. These are the people who are representing the company, and should be accounted for what they are doing online. Wal-Mart’s social media policy has a good start, but could definitely use some editing. The main point should be the associate’s guidelines, and make that first and bolded, while making the Twitter and Facebook expectations on the bottom and less of a focus. On the other hand, I think what is expected from the employees is pretty well laid out. They expected their employees to know the rules of the information policy, on what is confidential information and should not be posted on social media. They want their employees to know that social media platforms are not the place to talk about their job. If there seems to be a problem, they should speak with their manager, not the corporate Twitter account. And lastly, they do not want their employees answering questions on Facebook/Twitter. That is the duty of the social media manager, and will be taken care of through them. Overall I think it is very much important to put a policy in place. While telling employees verbally what is expect from them could be quicker, guidelines/rules are much more definite and expected when written down, universally for all of the employees. This way, no one can argue any which way because it can easy be sent to all employees. This is a must for any company that wants to keep all employees on the same level and keep communication strong. I thought the bit about faux Wal-Mart Twitter accounts was interesting. The fact that they (or their clientele) are sometimes made fun of probably makes them especially way of that. I also agree, that they shouldn’t have rules for their followers. The guidelines for their employees is really important, especially since they are so large!